Wed., Nov. 7, 2018, 3:57 p.m.
Napping on a flight from Spokane to Denver, Ashley Valdivieso, a freshman on the Eastern Washington women’s soccer team en route to last week’s Big Sky Conference Tournament, woke up to a woman’s screams. Across the aisle, Valdivieso said, the distressed woman’s husband was pale, unresponsive and didn’t have a pulse. Amid the commotion, a Southwest Airlines flight attendant asked if any nearby passengers knew CPR. Valdivieso did, and took immediate action. She helped lie the man down in the aisle and began compressions as the plane was on its descent. It was the first time she’d applied CPR on an adult, a man Valdivieso said appeared to be in his late 30s or early 40s. She doesn’t know what caused the man to stop breathing. The Scottsdale, Arizona, native worked as a nanny through a service that requires employees to have CPR certification. Valdivieso doesn’t plan on pursuing a career in the medical field – she is studying graphic design and media at EWU – but she said helping someone was a great feeling. “I knew I had some sort of impact, and I’m proud of myself for stepping up,” she said. Her teammates, who were all on the back of the plane while she was sitting in exit row near the front, didn’t know a man needed CPR, she said. The Eagles (8-8-3), who qualified for their fifth straight Big Sky Conference Tournament, ended their season Oct. 31 with a 3-1 loss to Northern Colorado in the first round. 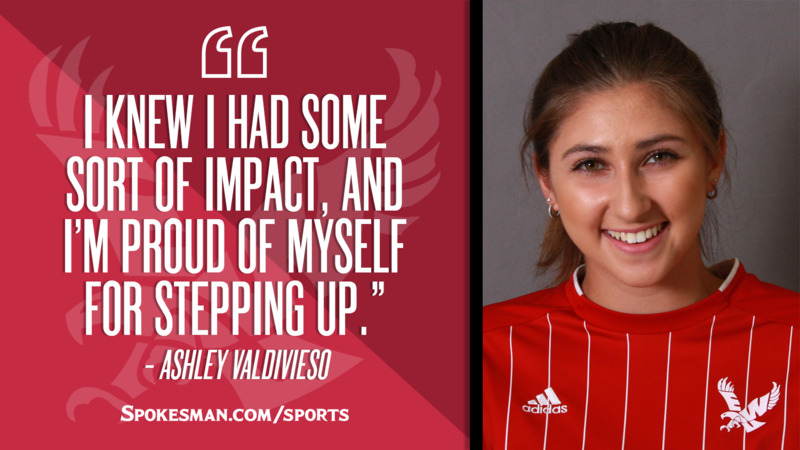 Valdivieso, Desert Mountain High School’s all-time leader in goals and assists, appeared in four matches for EWU. Published: Nov. 7, 2018, 3:57 p.m.